Every year, between 20 and 50 million tons of electronic waste is generated! As the rate of new electronic devices increases, it becomes more imperitive to create green electronics. Springboarding from this need, researchers at the University of Wisconsin led by Prof. Zhenqiang Ma have created a material from wood to mount electronic componets. Every month this column shines a light on the technology of our future- Fireside Chats’ latest installment is on Prof. Ma’s Cellulose NanoFibrils (CNF). Ma’s team has created a material that can replace rigid, potentially toxic, non-biogegradable, and non-renewable silicone boards which are widely used today. CNF boards are flexible, biodegrade from a common fungus, can be made with plant matter, and are non toxic. The greatest challenge to CNF is the availability of cheap silicon boards, which makes up 99% of a computer chip. CNF is made by processing wood waste found at paper or lumber mills until the wood fibers have broken down into much smaller particles. The ‘gel’ that is created from this process is then freeze dried to remove any remaining water. An epoxy coating developed with the US Department of Agriculture’s Forest Products Library is then applied to make the material smooth enough to mount circuitry. This coating also keeps the CNF board from absorbing moisture which might cause the board to expand or warp. Although the technology is ready for production, greater demand for e-waste reduction, rise in silicone cost, or the need for flexible chips may be required before this new material is utilized. 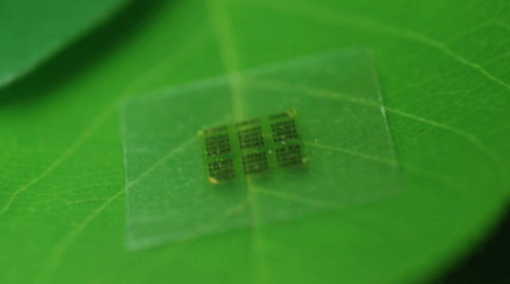 Biodegradeable chips may have additional uses compared to traditional chips. The military is interested in technology that can degrade quickly if the device contains sensitive information. Medical research is being conducted to find ways to make electronic devices that are implanted into the human body safer and more effective. Our world increasingly relies on electronics to accomplish everyday tasks, hopefully new materials such as CNF will protect future generations from harmful e-waste.